(California Department of Fish and Wildlife ) A young, female bear with paws badly burned in the Carr Fire is rescued by the California Department of Fish and Wildlife, and is treated with fish skin. 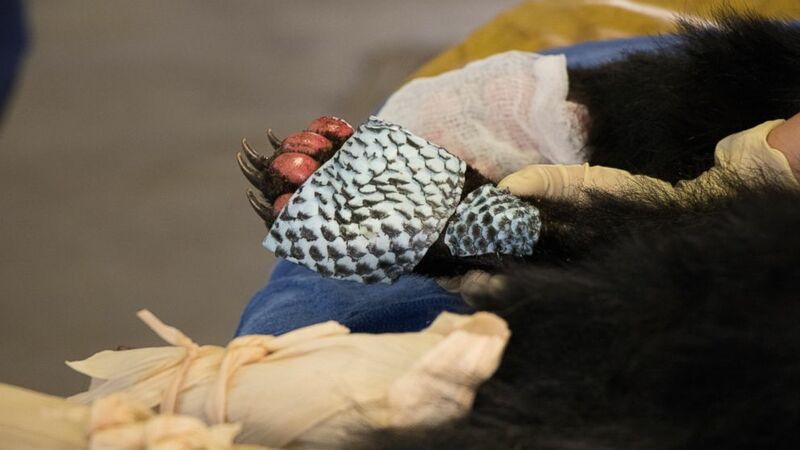 Recently, Dr. Jamie Peyton received a phone call from a fellow veterinarian at the California Department of Fish and Wildlife regarding a yearling bear cub that sustained severe, third-degree burns on her paws and feet. In addition to being unable to walk or move from the severity of her burn injury, there were active fires burning nearby that placed her life at risk. The bear cub is approximately 1 years old, estimated Peyton, a board-certified veterinarian in emergency and critical care, and showed promising signs of a fast recovery due to her young age, overall good health, voracious appetite, active lifestyle, spunky attitude, and the prompt treatment she received. The time of year also makes a difference in the young cub's recovery. “Most bears are very active during the summer versus the winter when they would be hibernating," Peyton, who is internationally renowned for her interest in burn injuries, multidisciplinary pain management, and innovations in wound care, told ABC News. "Better health and all these factors are better for healing despite her wounds being so severe." Although she has experience treating bears with burn injuries in the past (she treated two adult bears injured by the Thomas fire in December), this bear is the youngest Peyton has treated and has more severe and extensive injuries. So she decided that the best remedy to treat the young bear would be fish skins. A young, female bear with paws badly burned in the Carr Fire is rescued by the California Department of Fish and Wildlife, and is treated with fish skin. What are some of the challenges in treating burns? Burn injuries don’t discriminate -- they affect all species. “Wildfires affect all of us -- I have been forced to evacuate from California wildfires five times," Peyton said. "It has driven me to advance areas of burn injury, wound care and pain management for patients." Dr. Deanna Clifford, a senior wildlife veterinarian at the California Department of Fish and Wildlife (CDFW), noted the challenges of treating wildlife with burn injuries. Prior to recent advances, “bears like this were not treated for this injury -- they were either euthanized or never found,” Peyton explained. Historically, burns were treated in patients with ointments and bandages, which is difficult to do for wild animals, particularly those with severe, third-degree burn injuries. Medical advances have led to the creation of skin and dermal substitutes that while very helpful, are prohibitively costly for both humans and animals alike -- sometimes costing thousands of dollars and rarely covered by insurance. It's why Peyton had the idea to look into other sources of biological dressings for wound care, like tilapia skin as bandages. In wild animals, veterinarians are trying to balance managing severe burn injuries, minimizing the times they have to immobilize and anesthetize animals to perform procedures, while also accelerating healing time. How did fish skins as bandages come to be used in the United States? Peyton first heard about fish skin -- specifically tilapia -- being used as a treatment option for burn injuries in Brazil from a YouTube video. Brazil, like many developing nations, does not have access to tissue banks. With limited resources, “You have to think outside the box so we tried this on animals that needed help," said Clifford. Given Peyton’s expertise, she recognized fish skin as a viable alternative to costly skin substitutes. “The tilapia serves as a biological band-aid that is helpful in multiple ways," Peyton explained. "It provides pain control, protection, and acts as a collagen scaffold for wound healing. We have been very pleased because we have seen good results with wounds healing faster than expected." Peyton also believes in using multi-modal therapy, which incorporates both medical-based treatments and holistic, integrated care. The bear has received both medications and non-drug based holistic therapy including acupuncture, chiropractic care, cold and infrared laser therapy, and TENS (transcutaneous electrical nerve stimulation) -- an electromagnetic field therapy that facilitates blood flow. To make the treatment more enticing, the bear is receiving her crushed pills in meatballs. What is it about fish skin that helps heal the burn? The tilapia provides direct, steady pressure to wounds, keeping bacteria out and staying on better and longer than any kind of regular, synthetic bandage, according to the CDFW. The process is simple -- Peyton buys the fish, cleans and sterilizes it, and sutures it onto the normal part of the animal’s skin and directly over the burn injury itself. Before applying the tilapia dressing, this bear’s skin was cleaned and debrided and a medical-grade honey balm mixed with beeswax was applied to her feet to acclimate her skin and assess her walking. It was also important to rule out any signs of infection. Immediately, the veterinary team noticed she was not bearing weight. Prior to the application of the fish skin, the bear was licking her paws constantly, “a sign of concern," Peyton said. “The animal pain response is that they will lick their wounds when something hurts,” Peyton added. Once the tilapia was applied, she did not fuss with her paws at all. “She has not taken the dressing off or licked it, which lets us know she has been getting pain relief from this,” Peyton said. Over time, the fish skin will dry out and act as a protective, leather-like shield. It was sutured on to prevent it from coming off, and the bear will be reassessed in the next couple of days for progress.